﻿Do Protease Inhibitors Increase Preterm Births in Human Immunodeficiency Virus-Infected Patients? Do Protease Inhibitors Increase Preterm Births in Human Immunodeficiency Virus-Infected Patients? 1Department of Obstetrics, Gynecology and Women’s Health, UMDNJ-New Jersey Medical School, Newark, USA; 2Department of Preventive Medicine and Community Health, UMDNJ-New Jersey Medical School, Newark, USA; 3Department of Obstetrics and Gynecology, Hackensack University Medical Center, Hackensack, USA. Copyright © 2013 Shauna F. Williams et al. This is an open access article distributed under the Creative Commons Attribution License, which permits unrestricted use, distribution, and reproduction in any medium, provided the original work is properly cited. Objective: To compare preterm delivery (PTD) rates in HIV-infected patients on a protease inhibitor (PI)-based and a PI-sparing regimen. Study Design: This is a retrospective review of records of HIV-infected pregnant women between 2000 and 2007 at University Hospital, Newark, NJ. Patients were grouped according to PI exposure during pregnancy. Rates of preterm birth were compared, and the analysis was performed irrespectively of the etiology or indication of the preterm birth. Multivariate analysis including substance use, PI use, initial CD4 count, and history of PTD was performed. Results: There were 129 pregnant women in the PI group and 59 in the PI-sparing group. The PTD rate did not differ between the PI group and PI-sparing group (27.9% vs 25.4%, P = 0.72). 28.6% of those who delivered preterm had a previous PTD compared to 8.4% of those who delivered at term (P = 0.0019). Patients who delivered preterm had a higher rate of substance use (37.3% vs 19.7%, P = 0.0128). In the multivariate analysis, only history of PTD was significant (P = 0.018). Conclusion: Contrary to other studies, PIs were not associated with PTD. Other known risk factors of PTD, specifically past PTD and substance use, should be considered and targeted for risk reduction during pregnancy. Highly active antiretroviral therapy (HAART) is recommended for all pregnant women infected with Human Immunodeficiency Virus (HIV) to manage their disease and to reduce mother to child transmission (MTCT) . For most pregnant women, a protease inhibitor (PI) is used as a part of the HAART regimen as maternal or fetal safety concerns have been attributed to the use of some non-nucleoside reverse transcriptase inhibitors (NNRTI) during pregnancy. As use of PIs has increased, several obstetrical complications have been reported including preterm delivery (PTD) [2,3]. Given the benefits of HAART use in decreasing mortality, morbidity of HIV-infected pregnant women as well as MTCT, it is likely that in resource rich countries like the United States this approach will continue to be used during pregnancy. Thus we need to ascertain the risks and benefits of this approach as new categories of antiretroviral (ARV) agents are approved and introduced into obstetrical care. Twenty-two to 34% of deliveries among HIV-infected women in the United States are at less than 38 weeks . PTD increases the risk for neonatal morbidity and health care costs therefore appropriate prevention is imperative. If PIs significantly contribute to the rate of PTD, alternative approaches to decrease MTCT could be considered for women who do not need treatment for themselves. The objective of this study was to compare the rates of PTD and associated risk factors in HIV-infected patients on a PI-based versus a PI-sparing regimen at our institution over a seven year period. This is a retrospective cohort study of HIV-infected pregnant women identified through the electronic medical record by ICD-9 code. Patients were included if they had a singleton pregnancy, with prenatal care and delivery at University Hospital, Newark, New Jersey between July 1, 2000 and November 1, 2007. They were also required to receive ARV therapy initiated before or during the index pregnancy, and have the primary variables available for this analysis. Institutional Review Board approval was obtained prior to initiating the study. Patient records were reviewed and the following variables were abstracted: maternal demographics, ARV regimen, viral load and CD4 counts at initiation of prenatal care and closest to delivery, medical and obstetric complications, gestational age at time of delivery and infant birth weight. The duration of ARV treatment was documented in weeks (gestational age at delivery minus gestational age when treatment was initiated). In women who were on treatment prior to pregnancy, we assumed initiation of therapy was on the first day of the last menstrual period (LMP) unless we had chart documentation of the day of initial therapy. Gestational age at delivery was determined by the first day of the LMP if consistent with clinical assessment and sonogram or by sonogram if the LMP was unknown. PTD was defined as a birth prior to 37 weeks. Maternal history of PTD was documented based on recorded data at the initial prenatal visit at our institution, the medical records of referring institutions or a birth weight less than 5 pounds if the gestational age was not known. This birth weight was used as most patients did not recall the birth weight in grams or the exact gestational age, and therefore would be the best determination of prematurity by patient report. Substance use was defined as any cocaine, heroin, methadone or marijuana use during the pregnancy, either reported by the patient or documented by a positive urine toxicology screen. 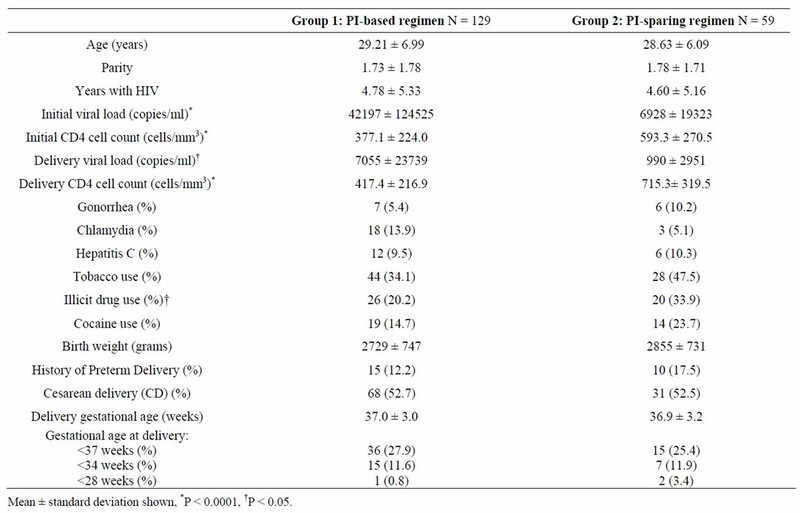 We analyzed the data based on the ARV treatment received during pregnancy, grouping together those who received a PI during pregnancy (group 1) and those who did not receive a PI during pregnancy (group 2) and performed the analysis irrespective of the etiology or indication of the preterm birth. The Kolmogorov-Smirnov test was used to test for normality of the data. SAS version 9.1 was used for statistical analysis. Continuous data are presented as mean and standard deviation. Student’s t-test, Kruskal-Wallis and Chi-square tests were used to compare variables and outcomes between the two groups. After identifying the variables that were significant in the univariate analysis, the regression model was created using these significant variables. We had predetermined including initial CD4 count as a surrogate for level of disease. The factors that were put into the model were substance use, PI use, initial CD4 count, and history of PTD. 188 pregnancies were identified for inclusion during the study period. Group 1 (PI-based) consisted of 129(68.6%) pregnancies, and group 2 had 59 (31.4%) pregnancies. The mean age for the entire cohort was 29.0 ± 6.7 years, and there was no significant difference between the two groups (Table 1). Tobacco and drug exposures were high overall, with 38% of patients admitting to tobacco use and 25% of patients reporting or testing positive for illicit drugs. Although cocaine use was similar in both groups (14.7% vs 23.7%, P = 0.15), overall illicit drug use was higher in the PI-sparing group (20.2 vs 33.9%, P = 0.04). Rates of gonorrhea or chlamydia infection during pregnancy or hepatitis C were not different between the groups (Table 1). Previous obstetric history was available for 180 patients. Among multiparous patients, 19% (25/130) had a history of PTD. There was no difference in rate of prior preterm delivery between the two study groups: 12.2% of group 1 compared with 17.5% of group 2 (P = 0.07). Thirty-six of the patients (28%) who were on a PIbased regimen were started prior to pregnancy, and 15 (12%) initiated treatment prior to 14 weeks. Patients who received a PI-based regimen had higher initial viral loads (42,197 ± 124,524 vs 6928 ± 19,323 copies/ml, P < 0.0001) and lower initial CD4 counts (377.1 ± 224.0 vs 593.3 ± 270.5 cells/mm3, P < 0.0001). The overall rate of preterm birth for the cohort was 27.1% (N = 51) with no significant difference in the rates of PTD based on PI exposure (27.9% vs 25.4%, P = 0.72). Twenty-two patients delivered prior to 34 weeks, and the rate did not differ by group: 11.6% of the PI-based group and 11.9% of the PI-sparing group. Only 3 patients (1.6%) delivered prior to 28 weeks, 2 were from the PI-sparing group. Among patients who delivered preterm, 14 (28.6%) had a history of a prior PTD compared to 11 (8.4%) in those who delivered at term (P = 0.002). In those who delivered preterm, 19 (37.3%) had a history of substance use, compared to 27 (19.7%) who delivered at term (P = 0.013), which then gives an attributable risk of 0.19. Cocaine use, in particular, was found in 16 (31.4%) of those with a preterm delivery compared to 17 (12.4%) of those who delivered at term (P = 0.002). Tobacco use was high overall, but the rates were not different in the preterm group compared to the term group (47.1% vs 35.0%, P = 0.18). We looked at the rate of pre-pregnancy initiation of PIs in the preterm group compared to the group who delivered at term, and the rates were not significantly different between the groups (16.7% vs 32.3%, P = 0.085). The mean duration of therapy for those who delivered at term was 23.2 ± 12.3 weeks compared to 17.4 ± 10.2 weeks for those who delivered preterm (P = 0.014). When comparing a duration of therapy of less than 10 weeks and 10 weeks or greater, the rate of PTD was not different (OR 1.88, 95% CI 0.73 - 4.83). Table 1. Characteristics and outcomes of the cohort. When excluding patients with a history of PTD, there was still no significant difference in the rate of preterm birth in patients on a PI regimen. Additionally, we looked specifically at the outcomes of nulliparous patients: 36 were on a PI and 14 were not, and there was also no difference in preterm birth rates (22% vs 35%, respectively, P = 0.47). In a multivariate analysis that included past PTD, drug use, PI use and initial CD4 count, only a history of PTD was significantly associated with preterm birth (OR 3.703, 95% CI 1.395 - 9.830) (Table 2). Past PTD and drug use were highly correlated (P < 0.0001), with 60% of patients with a history of PTD having a history of substance use. Initial viral load was not different between the term and preterm group (26,627 ± 86,933 and 43,948 ± 144,072 copies/ml, respectively P = 0.063). In order to examine if immune status was related to risk of PTD, we grouped patients according to initial CD4 values (less than 200 or greater than and equal to 200 cells/mm3), and rates of PTD were still similar between the two groups (29.7% vs 26.5%, respectively, P = 0.68). Reasons for PTD included spontaneous preterm labor (N = 13), preterm premature rupture of membranes (N = 21), hypertensive disorders (N = 8), oligohydramnios or intrauterine growth restriction (N = 4), chorioamnionitis (N = 1), abruption (N = 1) and 3 were unknown. When the analysis was repeated excluding patients who delivered preterm for preeclampsia or other hypertensive disorders and those without clear documentation of etiology, there was still no difference in rates of PTD in the PI-based versus the PI-sparing group, and the relationships with drug use, past obstetric history and PTD were still significant. Our review of deliveries over a 7-year period at our institution does not demonstrate an increasing risk of prematurity in the group who received PIs during pregnancy. Past preterm birth and substance use, known risk factors for PTD, were significant and history of preterm birth remained significant in the multivariate analysis. Prepregnancy exposure to PIs, initial CD4 count and viral load were not different in the term and preterm group. Table 2. Characteristics of patients who delivered at less than 37 weeks. birth remained significant after adjusting for other factors. Tobacco, a known risk factor for preterm delivery, was not an independent risk factor in this cohort, so it was not included in the regression analysis. Cocaine use is another known risk factor associated with adverse pregnancy outcome, including preterm birth and low birth weight [8-10]. Preterm delivery rate in cocaine-exposed pregnancies was 40% in one cohort . In another study of patients presenting with preterm labor, cocaine use was the only factor associated with PTD less than 34 weeks . Our results supported this association, as substance use was significantly higher in the preterm group, and specifically cocaine use was more than 2 times higher in the preterm group. The high rates of substance use in our cohort are similar to what has been reported by the CDC, as 20% of HIV-infected pregnant patients from 2000-2003 have a history of illicit drug use, and 14% have a positive drug screen during pregnancy . Our single-site retrospective analysis contributes to the body of information that highlights substance use as an important contributing factor for preterm birth among HIVinfected pregnant women. Thus we strongly advocate for broader efforts in early screening and implementation of behavior modification regarding substance use during pregnancy in order to effectively decrease the risk of PTD in this high risk population. Regarding PI use and risk of prematurity, conflicting data have emerged about this association. The initial report from the collaborative Swiss cohort, documented a 33% preterm birth rate among women receiving combination therapy. Although they adjusted for opiate use, clinical stage and primary cesarean section, they did not include past obstetric history and other drug use in their analysis . In the United States, a review of data from seven studies published in 2002 did not demonstrate an association between PI-based regimens and PTD . A single-site study adjusted for several variables including prior PTD, CD4 cell count and illicit substance use, and found that combination therapy with a PI was associated with PTD. Overall the PTD rate was similar to what we found in our cohort (26.8% for patients on any ARV), but patients on combination therapy with a PI from 1995-1997 had a particularly high PTD rate (70%). Interestingly after 1997, there was no difference in delivery prior to 37 weeks by treatment regimen . The Pediatric Spectrum of HIV disease, another large cohort, reviewed trends in preterm delivery from 1989 to 2004. In their adjusted analysis, they found that drug use and combination therapy with a PI among other factors were associated with preterm birth . The National Study of HIV in Pregnancy and Childhood, from the United Kingdom and Ireland, reviewed outcomes over a 15 year period (1990-2005). The prematurity rate was 14.1% in HAART-exposed pregnancies, and although HAART was associated with PTD, the risk was not different in the PI-exposed group. Also the relevance is that history of preterm birth was not available for this cohort . Ravizza et al. found that only hepatitis C infection and PI use were significant variables leading to preterm birth in their multivariate analysis, but contrary to our observations prior preterm birth was not significant . In summary, we did not find an increase in risk of PTD with PI use but the data from our cohort supported the association of well established risk factors in the obstetric literature such as substance use and past PTD with preterm birth in this population. Although no longer significant in the multivariate analysis, likely because of the strong correlation with past preterm birth, substance use was significantly associated with PTD in the univariate analysis. As the design of our study was retrospective, several limitations must be acknowledged. First, our analysis is based on chart documentation which can be affected by patient report and available laboratory studies. Nonetheless, it is likely that patients underreport substance use so the impact of this variable on PTD may be higher than what we observe. Patient recall bias of their past history could also underestimate their history of PTD. Likewise suboptimal adherence to therapy could underestimate the effect of PIs on the risk of PTD. To our knowledge such data has not been previously reported and should be monitored prospectively in observational cohorts. This study provides reassuring information about the use of PIs during pregnancy and supports the use of HAART for maternal health and reduces MTCT in the United States. Nonetheless, our rate of preterm birth (27.1%) is higher than the national average which suggests that as obstetricians we must consider and address other modifiable factors that may affect pregnancy outcome. Early identification of known risk factors, such as prior preterm birth and substance use, allow us to implement appropriate strategies and support services such as substance abuse programs or the use of 17-alpha hydroxyprogesterone caproate in patients with idiopathic preterm birth. As new therapeutic strategies are introduced in the management of the HIV-infected pregnant woman, prospective monitoring of preterm birth rates should be implemented to optimize the ARV regimen for the pregnant woman. B. M. Mercer, R. L. Goldenberg, A. H. Moawad, P. J. Meis, J. D. Iams, A. F. Das, et al., “The Preterm Prediction Study: Effect of Gestational Age and Cause of Preterm Birth on Subsequent Obstetric Outcome. National Institute of Child Health and Human Development Maternal-Fetal Medicine Units Network,” American Journal of Obstetrics and Gynecology, Vol. 181, No. 5, 1999, pp. 1216-1221. M. E. Sprauve, M. K. Lindsay, S. Herbert and W. Graves, “Adverse Perinatal Outcome in Parturients Who Use Crack Cocaine,” Obstetrics and Gynecology, Vol. 89, No. 5, 1997, pp. 674-678.